To simply view the images in this project, please click on the picture below. For those of you who wish to read something about this project, my statement is available below. 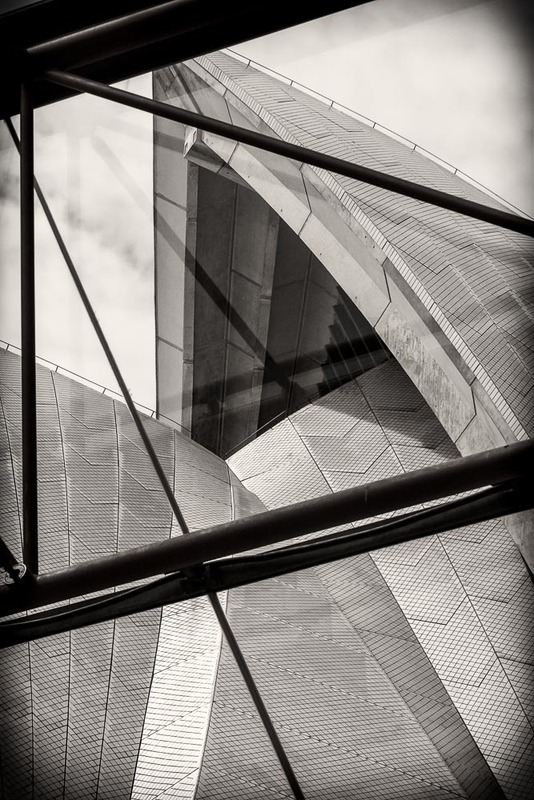 The ingenious design of the Sydney Opera House by architect Jorn Utzon has been the creative source of inspiration for many artists since it was opened to the public in 1973. My wife and I toured this world-class marvel in 2010. Many complex instrumental arrangements come together to form the underlying musical movements within an opera. Likewise, many architectural elements came together to form the final look of the facility’s famous “sails”. When completed, 6,223 square meters of glass were used, 350 kilometers of tension cable, and 1,056,005 roof tiles completed the shape. The foundation of the exterior is supported by concrete ceiling beams which were designed to replace the need for columns. Just like the movements within an opera, these change shape as they rise to support the roof. Like many artists before me, I, too, have been inspired creatively by this World Heritage landmark. My project is simply a celebration of the sense of awe I experienced during our tour. My series starts with the exterior overture and moves recitatively through the interior arias. I have chosen to present an intimate look through the opera-like arrangements of the lines, shapes, and forms as I saw and felt them.